Custom-made, computer-controlled solid state power sources for microwave power applications. QWED cooperates with the team of engineers from the Institute of Radioelectronics, Warsaw University of Technology (IRE WUT), in design and manufacturing of specialised solid state sources of microwave power. The sources are destined for microwave power applications including precision heating, microwave chemistry, plasma generation, etc. A general view of the unit producing 200 W of CW power in the 2.45GHz ISM band combining of 4 60W GaN HEMTs. possibilities of external computer control of generated frequency and power as a function of time or data acquired as a feedback from the physical system. Block diagram of a typical solid state microwave power unit. The well-known limitation of usage of the solid state sources, namely their relatively high price, has been mitigated due to the progress in manufacturing of high power transistors based on Si LDMOSFET and GaN HEMT technologies. size: 19" rack enclosure, typically 4U high. automatic tuning of the frequency of the system, to the minimum of reflection from the load changing in time. Microwave power units can be used for precision heating of relatively small volumes. Typical examples can be found in microwave chemistry applications. Narrow spectrum of the source allows choosing a specific mode of the resonant cavity in which the substance is being heated. The computerised system can lock the generator to that mode, even when the resonant frequency of the cavity changes due to changing temperature of the load. 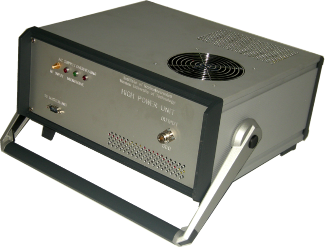 Microwave power units can be used for measurement of leakage from microwave power installations. When a leakage is detected in a high power microwave installation driven by a magnetron source, it is quite difficult to detect its cause precisely. To control the leakage we need to know its frequency dependence which cannot be measured using the magnetron source. Microwave power units can be used to deliver power of the same frequency but with individual amplitudes and phase shifts between, computer controlled from a single Master Unit. An example application of that kind of setup for microwave heating - feeding a microwave cavity from multiple sources with controlled phases of the signals can bring a significant improvement in the heating efficiency. Continuous sweep of excitation frequency from start to stop settings. Sweep of excitation frequency from start to stop settings, lock at maximum output power (minimum reflection). If start and stop frequencies are the same, set a fixed excitation frequency. Sweep time for frequency sweep. Output Data from MPU Time Marker. Log(output power)= Log(transmitted power)-Log(reflected power). If start and stop frequency are the same, set a fixed excitation frequency. Set sweep time for frequency sweep. Choose continuous sweep of excitation frequency from start to stop settings. Choose sweep of excitation frequency from start to stop settings, lock at maximum output power (minimum reflection).